To observe the epithelial remodeling over a 9-mm diameter cornea induced by topography-guided femtosecond laser–assisted in situ keratomileusis (FS-LASIK) for myopia correction using spectral-domain optical coherence tomography (SD-OCT). Forty-three eyes of 22 patients who underwent topography-guided FS-LASIK for myopic correction were included. The “Pachymetrywide” scan pattern was used to generate the epithelial thickness map using SD-OCT preoperatively and 1, 3, and 6 months postoperatively. Epithelial thickness was compared and analyzed by section and zone. Compared to the preoperative values, the change in the average epithelial thickness in the central, paracentral, and mid-peripheral zones was 2.09, 4.53, and −0.87 µm at 1 month; 3.00, 4.61, and −0.97 µm at 3 months; and 3.28, 4.55, and −0.81 µm at 6 months postoperatively, respectively. From 1 to 3 months postoperatively, the central epithelial thickness changed significantly (P = .021), whereas the epithelial thickness in the paracentral (P = .973) and mid-peripheral (P = .996) zones stabilized. No significant epithelial thickness change was observed in the zones between 3 and 6 months postoperatively (all P > .05). The epithelial thickness in the paracentral inferotemporal section increased by 12.7% at 6 months after surgery. The central epithelial hyperplasia showed no correlation with the change in postoperative manifest refraction spherical equivalent (P = .313). After topography-guided FS-LASIK, the 9-mm diameter epithelial thickness showed a longitudinal and regional non-uniform redistribution. Central epithelial remodeling stabilized more slowly. The greatest increase in epithelial thickness was observed in the paracentral inferotemporal section. This epithelial remodeling did not cause refractive regression. Topography-guided laser ablation is designed to reduce the irregular corneal surface by using a customized excimer platform.19,20 This procedure has been used in Europe since 199821 and it was approved by the U.S. Food and Drug Administration in 2013 for use in primary eyes with regular astigmatism.22 It has been demonstrated that the corneal epithelium remodels itself to compensate for the underlying stromal irregularities.23 Until now, no study has reported the corneal epithelial remodeling after topography-guided FS-LASIK. Our study aimed to observe the zonal and sectional epithelial remodeling profile across a 9-mm diameter cornea after topography-guided FS-LASIK using SD-OCT and to investigate its effect on the refractive outcomes. 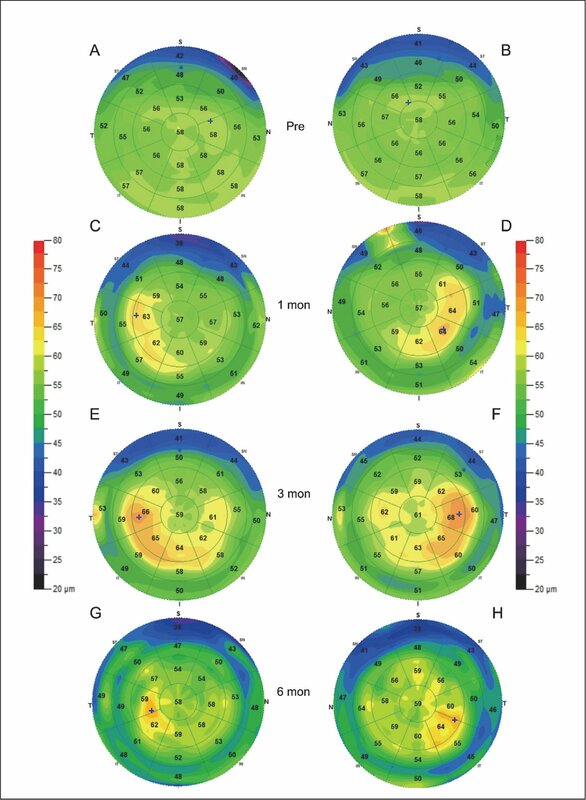 This prospective study included 43 eyes of 22 patients who underwent topography-guided FS-LASIK for myopic correction at Guangzhou Aier Eye Hospital from November 2017 to April 2018. All patients were 18 to 45 years old and had stable myopia for more than 2 years. 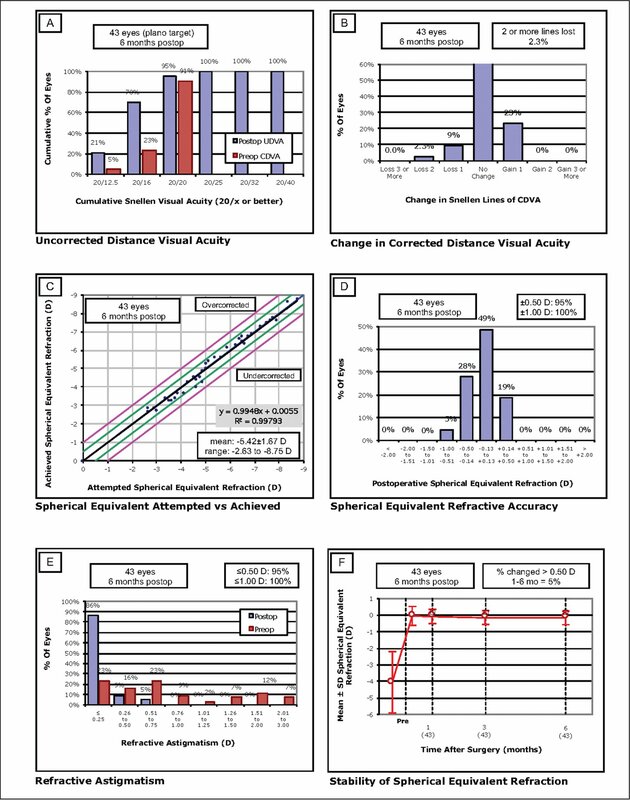 The corrected distance visual acuity (CDVA) was 20/25 or better. Additional inclusion criteria were a central corneal thickness of no less than 480 µm and a calculated postoperative residual stromal bed of more than 280 µm. Patients who had a previous history of ocular disease or surgery were excluded from this study. The study was approved by the local ethics committee of Aier Eye Hospital in Guangzhou, China, and all patients signed an informed consent form during the initial visit. Preoperatively, all patients received a thorough clinical examination, including medical history, CDVA, non-contact tonometry (CT-1; Topcon, Tokyo, Japan), slit-lamp biomicroscopy, fundus examination, dry eye test, manifest and cycloplegic refraction, corneal Scheimpflug tomography (Pentacam HR; Oculus Optikgeräte, Wetzlar, Germany), Placido disc topography (Vario Topolyzer; WaveLight, Erlagen, Germany), and an epithelial thickness profile using RTVue XR anterior segment OCT (AS-OCT) (version 2017.1.0.155; Optovue, Inc., Fremont, CA). Patients were reexamined at 1, 3, and 6 months postoperatively. Levofloxacin 0.3% eye drops (Cravit; Santen Pharmaceutical Co., Ltd., Osaka, Japan) were applied four times daily for 3 days preoperatively and 1 week postoperatively. Postoperative treatment regimens included loteprednol etabonate ophthalmic suspension 0.5% eye drops (Lotemax; Bausch & Lomb, Rochester, NY), which were applied four times daily during the first week, and lacrimal substitutes for 3 months. Approximately eight topographic maps were obtained for each eye and compared with the Vario Topolyzer until the local curvature difference between the two maps was less than 0.75 diopters (D). The cylindrical refraction was adjusted to match the amount and axis of the topographically measured cylinder. The spherical refraction was adjusted according to the nomogram recommendation (A_LI_D1_Nomogramm STD_10_2007 Rev.0 Mar2011) provided by Alcon Laboratories, Inc. (Fort Worth, TX). All procedures were performed by the same experienced ophthalmologist (ZW) using the Alcon WaveLight Refractive Suite (Alcon Laboratories, Inc.). For all cases, a 120-µm thick and 8.5-mm diameter wide corneal flap was applied using the Alcon WaveLight FS200 femtosecond laser (Alcon Laboratories, Inc.). The side cut angle was 70° and the hinge position was superior. The Alcon WaveLight EX500 excimer laser (Alcon Laboratories, Inc.) was used for myopic ablation. A 6.5-mm optical zone and a 1.25-mm transition zone were used for the correction. The epithelial and total thickness data across a 9-mm diameter cornea were obtained using the “Pachymetry-wide” scan pattern of the RTVue XR with a corneal adaptor module. The maps were generated using an automatic algorithm and each map was divided into a total of 25 sections by eight lines and four annular rings (2, 5, 7, and 9 mm) (Figure A, available in the online version of this article). In this study, the central 2-mm diameter cornea was defined as the central zone, the cornea within the annulus between the 2- and 5-mm diameter rings was defined as the paracentral zone, the cornea within the annulus between the 5- and 7-mm diameter rings was defined as the mid-peripheral zone, and the cornea within the annulus between the 7- and 9-mm diameter rings was defined as the peripheral zone. The epithelial thickness profile of a 26-year-old woman (A and B) preoperatively and (C and D) 1 month, (E and F) 3 months, and (G and H) 6 months after surgery. Each map is divided into four annular rings (2, 2 to 5, 5 to 7, and 7 to 9 mm). Each ring is sectioned as superior (S), superotemporal (ST), temporal (T), inferotemporal (IT), inferior (I), inferonasal (IN), nasal (N), and superonasal (SN), except the central ring. Epithelial thickness value is displayed by section. All scans were performed by two trained investigators (LF, BZ). Eye drops were avoided 2 hours before each examination. While “Green” was displayed on the quality scale bar and both vertical and horizontal reflections of the corneal apex stripes were observed, patients were told to blink quickly and the map was acquired within the next 2 seconds. Two images were obtained for each visit, and the same trained investigator confirmed the anterior and boundary segmentations. The image with better quality was chosen for analysis. SPSS for Mac software (version 23.0; SPSS, Inc., Chicago, IL) was used for statistical analysis. A descriptive statistic was used to calculate the mean and standard deviations. A one-way analysis of variance (ANOVA) test was used to analyze the epithelial thickness by zone and section. A repeated measures ANOVA with Bonferroni correction was used to compare the epithelial thickness preoperatively and 1, 3, and 6 months postoperatively. Pearson correlations were used to determine the correlation between epithelial thickening and the corrected spherical equivalent, central corneal thickness, ablation depth, ablation ratio, and preoperative epithelial thickness across the 5-mm diameter cornea. A P value of less than .05 was considered significant. Forty-three eyes of 22 patients (15 women and 7 men) with a mean age of 27.51 ± 7.15 years (range: 19 to 42 years) were included. The average preoperative spherical equivalent was −5.42 ± 1.67 D (range: −2.63 to −7.88 D). The mean cylinder degree was −0.92 ± 0.68 D (range: −0.25 to −2.50 D). The mean ablation depth was 88.72 ± 23.16 µm (range: 45 to 128 µm). Average preoperative central corneal thickness was 537.35 ± 23.10 µm (range: 485 to 572 µm). The mean residual stromal bed thickness was 331.16 ± 21.22 µm (range: 283 to 373 µm). The ablation ratio was 0.16 ± 0.04 (range: 0.08 to 0.24). The average epithelial thickness in different zones before and after surgery is shown in Figure 1A. Preoperatively, the differences in epithelial thickness between zones across a 7-mm diameter cornea were not statistically significant (F = 1.111, P = .333). 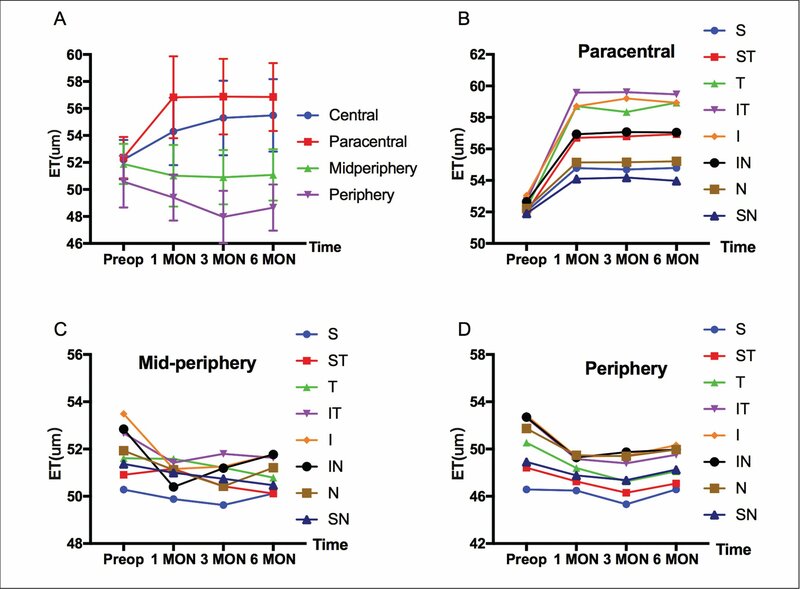 One month postoperatively, significant increases in epithelial thickness were observed in the central and paracentral zones (both P < .05), whereas a non-significant decrease was observed in the mid-peripheral zone (P > .05). From 1 to 3 months after surgery, epithelial thickness in the central zone increased significantly (P < .05) but was unaltered in the paracentral and mid-peripheral zones (P > .05) (Figure 1). No statistically significant changes were observed in all zones between 3 and 6 months after surgery (all P > .05) (Figure 1). Changes in epithelial thickness in 25 sections are shown in Figures 1B–1D and Figure 2. Postoperatively, there was a statistically significant increase in epithelial thickness in all inner nine sections (all P < .001) (Figures 1–2). The greatest change was observed in the inferotemporal section (Figure 2). In the mid-peripheral zone, a statistically significant decrease in epithelial thickness was observed in the inferonasal, inferior, and inferotemporal sections 1 month postoperatively (P < .05), and no significant change was observed between 1 and 6 months after surgery (P > .05) (Figures 1–2). Changes in epithelial thickness profile at (A) 1 and (B) 6 months after surgery. Six months postoperatively, the change of epithelial thickness in the central and paracentral inferotemporal zones showed statistically significant correlations with the corrected spherical equivalent, ablation depth, and ablation ratio (all P < .05) (Table 1). No correlations were found between the epithelial thickening and preoperative mean epithelial thickness (Table 1). Six months postoperatively, the mean visual acuity was −0.071 ± 0.071 logMAR (range: −0.079 to 0.097 logMAR). No significant regression was observed between 1 and 6 months after surgery (P > .05) (Figure 3). Previous studies have reported the corneal epithelial remodeling profiles after small incision lenticule extraction (SMILE),7,8,10 FS-LASIK,10,11 radial keratometry,9 and photorefractive keratectomy (PRK).24 Topography-guided FS-LASIK is performed to obtain a relatively regular corneal surface by converting a height map of the cornea using a Zernike or Fourier matrix.19,20 In this study, we observed the changes in epithelial thickness across a 9-mm diameter cornea using OCT and found that there was an non-uniform epithelial remodeling induced by topography-guided FS-LASIK for myopic correction. OCT measurement using the “Pachmetrywide” scan pattern covers a 9-mm diameter cornea and provides an extensive and comprehensive data of the corneal epithelium. Hashmani et al.18 reported a “vertical asymmetry” in epithelial thickness across a 9-mm diameter cornea in primary eyes. Our study demonstrated that the paracentral inferior epithelial thickness was 3.07 ± 2.70 µm thicker than the corresponding superior epithelial value. This vertical difference is similar to the reported tear film thickness (2 to 5.5 µm) in other studies.25,26 Our findings validated the accuracy of OCT measurement using the “Pachmetrywide” scan pattern. In addition to OCT, the Artemis very high-frequency digital ultrasound can be used to construct a wide corneal epithelial map.9,12,13,27 Reinstein et al.13 mapped the epithelial thickness changes across a 10-mm diameter cornea and demonstrated the existence of a central 4.8-mm zone of epithelial thickening surrounded by an annulus of epithelial thinning between the 5.6- and 8-mm diameters 12 months after FS-LASIK.13 Using OCT, we also found a postoperative decrease in the mid-peripheral epithelial thickness. This mid-peripheral epithelial thinning could be partially explained by Huang et al. 's study,28 where a mathematical model was created to estimate the epithelial thickness changes after laser surgery. Reinstein et al.29 also reported that the greatest curvature gradient occurred in the edge of the optical zone and the marginal epithelium would thin to compensate for the local curvature change after myopic correction, and our study confirmed it. Additionally, the changes in tear film thickness may influence the measured epithelial thickness value using OCT. With the tear film being incorporated into the measurement and the gravitational effect,30,31 OCT may overestimate the epithelial thickness value, especially in the inferior cornea. This overestimation may diminish with the postoperative tear film thinning.32,33 Consequently, a slight postoperative epithelial thickness thinning was expected. Our study also showed that the epithelial thickness difference between the corresponding inferior and superior sections decreased after surgery. In addition, we compared the postoperative changes of epithelial thickness over time in different zones. Our study showed that the epithelial remodeling rate varied in different zones. The epithelial remodeling took more time to stabilize in the central 2-mm zone than in the paracentral zone. This longitudinal, nonuniform remodeling may be based on Ebato et al. 's study,34 which found that the peripheral epithelium exhibited a more rapid proliferation than the central epithelium. This is because the corneal epithelial cells regenerated and migrated from the periphery to the center.34 Additionally, the epithelial remodeling in the paracentral zone may induce a new change in corneal curvature, which triggers further epithelial remodeling in the central zone. Previous studies have shown that epithelial thickening was closely related to the ablation depth and corrected spherical equivalent,8,10,11 and our study confirmed it. We demonstrated a positive correlation between epithelial thickening and ablation ratio. This is consistent with the theory of Huang et al.28 because laser surgery with a greater ablation ratio often induces a larger change in local corneal curvature. Corneal epithelial remodeling was considered to induce refractive regression after myopic correction.37 The correlation between corneal epithelial thickening and postoperative myopic shift has been reported after radial keratometry,9 PRK,38 LASIK,13 and SMILE.8 However, it was contrary in other studies.7,10,14,15 This inconsistency may be due to the different corrected spherical equivalents, refractive procedures (PRK, LASIK, or SMILE), and follow-up periods between studies. Additionally, postoperative dry eye also should be taken into account because it could result in epithelial thickening and refractive regression.36 Furthermore, a slight refractive change may not be demonstrated by the commonly used manifest refraction and more precise measurement is needed. In our study, no obvious refractive regression was observed and the manifest refractive spherical equivalent changed from +0.02 to −0.06 D between 1 and 6 months after surgery. However, we found that the difference in average epithelial thickness between the central and paracentral zone during this period reduced from −2.53 ± 1.62 to −1.36 ± 1.47 µm, which may result in a slight myopic shift. There are limitations in this study that need to be considered. First, both eyes were included. Second, because a planar-type OCT was used in our study, the accuracy of the peripheral epithelial thickness may be affected.17 Also, some deviation may have been caused by incorporating the tear film thickness into the epithelial thickness measurement. Additional studies are required to confirm our findings. We have reported a wide epithelial remodeling profile across a 9-mm diameter cornea after topography-guided FS-LASIK. An uneven corneal epithelial redistribution that did not affect the refractive stability was observed during the 6-month follow-up period. A comprehensive investigation of the corneal epithelial remodeling is advocated to refine the ablation algorithms and refractive procedures. Kanellopoulos AJ, Asimellis G. Longitudinal postoperative lasik epithelial thickness profile changes in correlation with degree of myopia correction. J Refract Surg. 2014;30:166–171. King-Smith PE, Fink BA, Fogt N, Nichols KK, Hill RM, Wilson GS. The thickness of the human precorneal tear film: evidence from reflection spectra. Invest Ophthalmol Vis Sci. 2000;41:3348–3359. Ebato B, Friend J, Thoft RA. Comparison of central and peripheral human corneal epithelium in tissue culture. Invest Ophthalmol Vis Sci. 1987;28:1450–1456. From the Aier School of Ophthalmology, Central South University, Changsha, China (LF, ZW); and Guangzhou Aier Eye Hospital, Guangzhou, China (LF, LX, BZ, ZW). Supported by the Guangzhou Municipal Medical Science and Technology Project (No. 20171A011331).